Syllabus of the Online Course (Subject): Ports of Nigeria (Lagos, Apapa, Port Harcourt, Onne, Rivers Port, Tin Can Island). Description of the Online Course: Nigerian ports. The Folawiyo Towers are in the Port of Lagos. Includes: Port Harcourt Port, Okrika Refined Petroleum, Kidney Island. The main cities near the Rivers Port Complex are Ataba, Port Harcourt, Elele, Emohia, Aba, Eberi, Ikot Epene, Omoku, Ihiagwa, OWerri, Umuahia, and Akabo. Access to several Nigerian states: Benue, Anambra, Ondo, Imo, Kogi, Enugu, Delta, and Edo. Maybe is the “Port of the Future” in Nigeria. 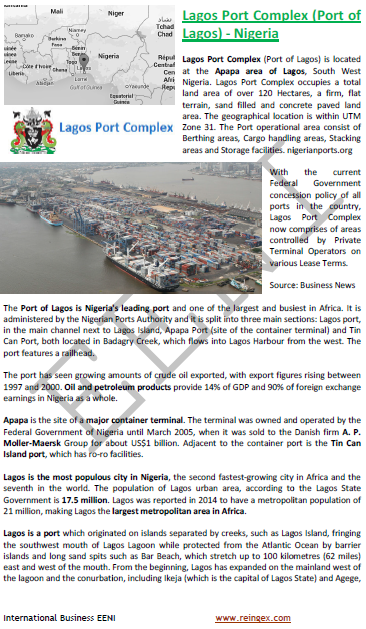 Main body: Nigerian Ports Authority.